Events in Ferguson, MO and elsewhere have inevitably brought to head long overdue discussions about race and community policing. On the day that the St. Louis Grand Jury decided not to indict Police Officer Darren Wilson in the Ferguson, MO shooting of unarmed black teen Michael Brown, a group focused on police-community relations in Grand Rapids, MI had come together to watch and discuss the Not In Our Town documentary, Waking in Oak Creek. 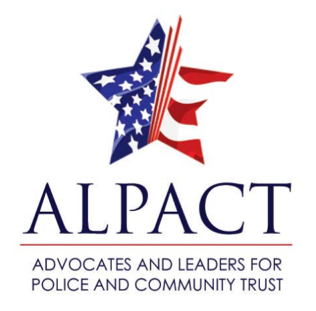 The group, Advocates and Leaders for Police and Community Trust (ALPACT), exists to grapple with these very issues. ALPACT started nearly 20 years ago in Detroit, when citizens complained that the city’s law enforcement officials were profiling and harassing them. “As a result of that, the decision was made—involving U.S. attorneys, law enforcement folks, government leaders, faith-based leaders, community leaders—to sit down at the table and talk,” Michigan Department of Civil Rights Executive Director Matt Wesaw recently told Michigan Radio. 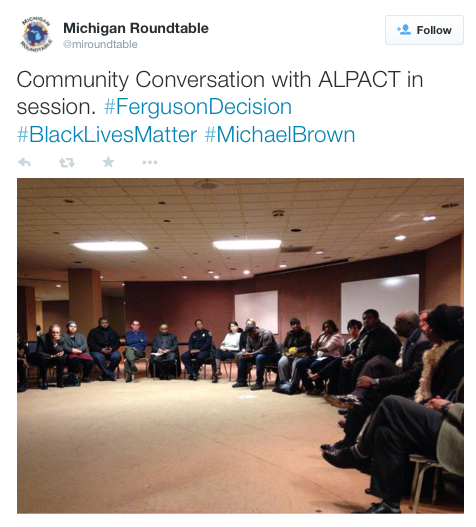 With five ALPACT chapters in Michigan, police and community continue to come together to talk. After the Waking in Oak Creek discussion, the Grand Rapids group planned to come together again in March, this time addressing the issue head-on. Together, they imagined a pseudo-racial incident that takes place in their community. The fake scenario is similar to what occurred in Ferguson. The purpose of this exercise was to get the group talking, grappling with questions such as: What are the things that we, as a group, would need to do immediately when such an incident happens? Who do we involve right away? Who needs to be at the table with law enforcement? Reaching Beyond Law Enforcement: What Am I Doing Here? Grand Rapids educator Julie Mushing was tapped to join the ALPACT committee. At first, Mushing wasn’t sure what role she could play in this law enforcement-focused group. “The first meeting was at the U.S. Marshall’s Office and I’m thinking, ‘What am I doing here?’” Mushing said. But as the group discussed how to move forward—particularly interested in how they could engage the very communities they sought to serve—Mushing saw how she could help. Mushing works as the diversity coordinator for Kent ISD, a regional service agency in Michigan’s Kent County that serves 20 public schools and several private schools. Through her work, she provides diversity learning opportunities for students and community members, including a year-long interfaith project that was featured on PBS. But more than that, Mushing is a connector, who’s not only committed to shining a light on bias, but bringing people together. For example, the ALPACT committee was concerned with ensuring the black community had presence and voice during discussions of racial profiling and that non-Christians were invited and engaged around issues of faith. Because of her work, Mushing was well-versed in Grand Rapids’ diverse community. “That was my purpose,” she said. Mushing has been present for discussions surrounding gang violence, immigration, recruiting and retaining officers of color, and media bias. She points to the work of other local groups such as scholarships for minority students who want to enter criminal justice fields, neighborhood revitalization, minority-owned businesses and an upcoming report on how racism impacts businesses’ bottom line. She even has a growing email list that she had started for the Kent ISD staff and school districts that feature diverse events around town. It gives the community a chance to get “a little out of the box.” The list now includes ALPACT members and law enforcement. “It gives police in this community an opportunity to attend and be a more visual presence,” she says. The Waking in Oak Creek documentary that ALPACT screened last fall features the town of Oak Creek, WI after a white supremacist walked into a gurdwara and gunned down six worshippers and shot a police lieutenant 17 times. Mushing remembers this hate incident, considered one the deadliest in recent U.S. history, and says those losses and lessons were felt in Grand Rapids as well. Police went to the gurdwara, or Sikh temple, in Grand Rapids, and offered to help with security. The larger community held a candlelight vigil. Mushing’s interfaith project had just kicked off, and it was an opportunity for one of her Sikh students to educate her peers on her faith. “When we got people from various faiths in our community—we have three mosques now—it’s an opportunity for us to have these conversations about what happened in Oak Creek,” she says. ALPACT leaders, including Mushing, saw the film at last year’s MI Response to Hate conference, hosted by the Michigan Alliance Against Hate Crimes. So when Mushing met with Michigan Western District Attorney General Patrick Miles Jr., also co-chair of ALPACT, to plan meetings for the following year, Mushing suggested screening Waking in Oak Creek. Miles, she says, had the same idea. ALPACT examines these issues, explores strategies, and develops recommendations. The Grand Rapids chapter is only in its second year and each meeting aims to feature dual speakers, one from law enforcement and one from the community. ALPACT chapters are now in five Michigan cities—including Saginaw, Flint, Benton Harbor and Grand Rapids. As unrest builds between police and communities in cities like Ferguson, MO, Michigan Department of Civil Rights Executive Director Matt Wesaw believes Michigan is “well above the curve” in building trust between law enforcement and the people they serve. Bring Waking in Oak Creek to your agency or town. Learn more here.